Cellar 24 opened its doors on Wood Street in Liverpool City Centre earlier this summer. Based at the site which was previously Django’s Riff, a few hundred yards from the hustle and bustle of Concert Square in Liverpool’s Ropewalks area, the venue has quickly become a popular hangout for gamers from all over the city. 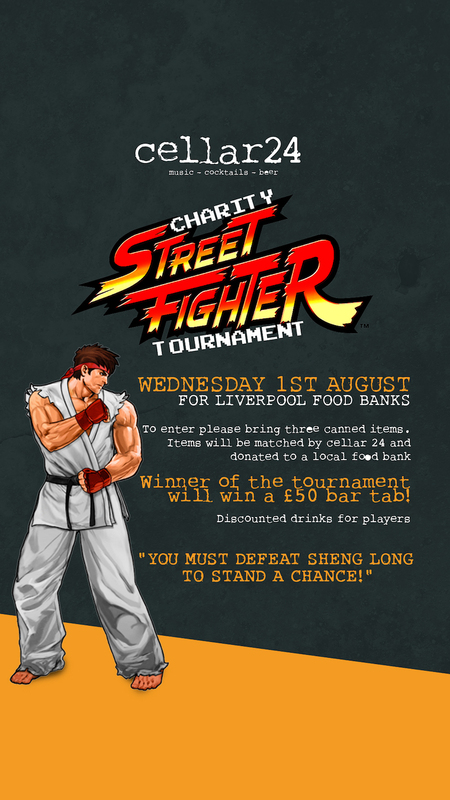 As a result of this the owners are putting together a “Street Fighter Gaming” competition this August over 30 years since the original fighting game was released. All in aid of a great local cause – food banks. So how many can enter the Street Fighter competition? 32 entrants to the Competition, with the venue itself holds 200. You need to bring 3 tinned items of food along with you per entrant. This will then be matched by the venue. So who is this event in aid of? We are going to give the proceeds between the South Liverpool and North Liverpool food banks. The Wood Street premises have been completely refurbished. With new booths, retro games, shisha, pool, beer pong and waitress service. Cellar 24’s walls have been painted by local artist, Paul Curtis, showing an aerial view of Liverpool’s city centre and keeping with the retro feel of the venue.